This balloon climbs over Istanbul with a lot more ease and speed than we could. We can only view the Galata Tower from a distance today. We, weighed down by injury and pain, are not equal to the climb. Things are not going as planned, and this is not helping Peter's mood. Peter is often cranky today. He has much less tolerance than in past trips. This troubles me. Is it his broken rib? Our shuttle brought us to a different hotel than the one we booked in. "There is a problem in your hotel," the manager told us, "so you are staying at this Collage hotel tonight and possibly tomorrow night as well. Something needs to be repaired, and since tomorrow is Sunday, it is doubtful whether a repairman will be able to come. You will probably be staying at our hotel until Monday." I'm not too unhappy about this. We have a nice, large room, and Jon has a room of his own in our suite. There are problems, however, with this hotel, located in the Cihangir part of Istanbul. 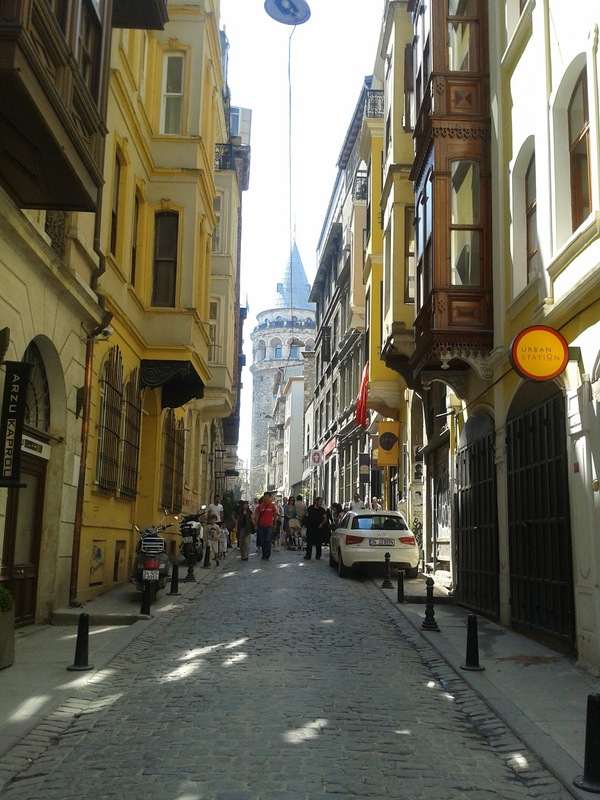 I read on the plane that Cihangir is a really cool, trendy part of Istanbul. The writer called it the "East Village" of Istanbul. It sure doesn't look it, though. The buildings don't look like anything special at all, and to get to Taksim Square, you have to climb the steepest hill I have ever seen. They don't have breakfast for us in our new hotel, either. "You'll be there in three minutes," promises the manager. I doubt it. We have to climb this steep hotel to get to another Collage hotel for breakfast. Oh, well. I am determined to take this in stride. I want to learn lesson four. I am going to accept what is, and adapt to it. I won't let a steep climb spoil my mood. But Peter sees it differently. I'm going to have to adapt to him, too. The manager of our new hotel, who looks like he's still in college, sprints up the hill with us to the Collage hotel at Taksim Square. He chats with me about Cihangir, the neighborhood the hotel is in. "This is where the movie producers, movie stars and soccer stars live. Here it costs over a million euros to buy an apartment." Unbelievable. By the time most of us reach the hotel, ten minutes later, I am huffing and puffing. Jon and the hotel manager are relaxed. The manager is used to the climb, and Jon works out each day. Peter is a block away and seems to be groaning with each step. His mood picks up, however, when he views the the breakfast buffet. It is a beautiful buffet visually, with cheese and meats cut into triangles and cream cheese in balls coated in things like coconut and sesame. There are sauces like tahini, yogurt and honey. Little crisp cucumbers and tomatoes with mint leaves explode with flavor in our mouths. Peter is so exhausted after breakfast, especially after that climb, which must be excruciating with his broken rib, he has to have a break. About a half hour later, we start out, intending to climb the Galata Tower, where we can have a look from it over the city. 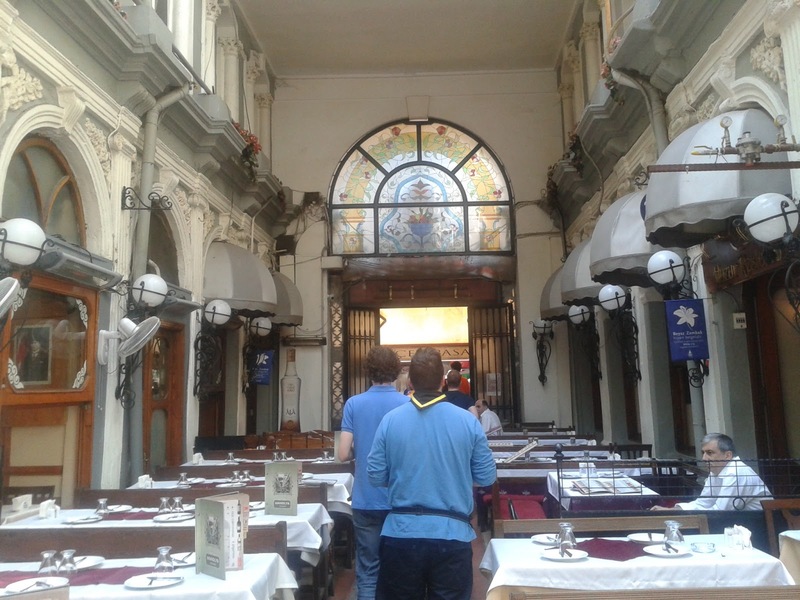 We walk all along the Istiklal, discovering different things than what we saw the last time in Istanbul. 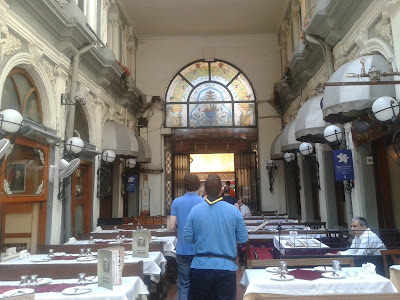 Today we stroll through old shopping arcades, several of them with stained glass. They have seen better days, but they are still charming. We look for a Sufi school that features sufi dancing at 3 pm, on the last Sunday a month, which happens to be today. The walk there winds downhill, less strenuous for Peter. We pass a café featuring chocolate and candles and a building with very peaceful flute music coming out from the window. Funny how music can transport me, putting me into a peaceful mood. The walk is pretty, past lute and other music instrument shops and boutiques. The streets are narrow, hilly, and winding. We later buy lute - oud music CDs at a really nice CD shop along that street. Peter loves the sound of the oud. He tells me he would love to try and play one. The afternoon performance of the whirling dervishes is sold out. We have to buy tickets for this evening, which means a change in plans. 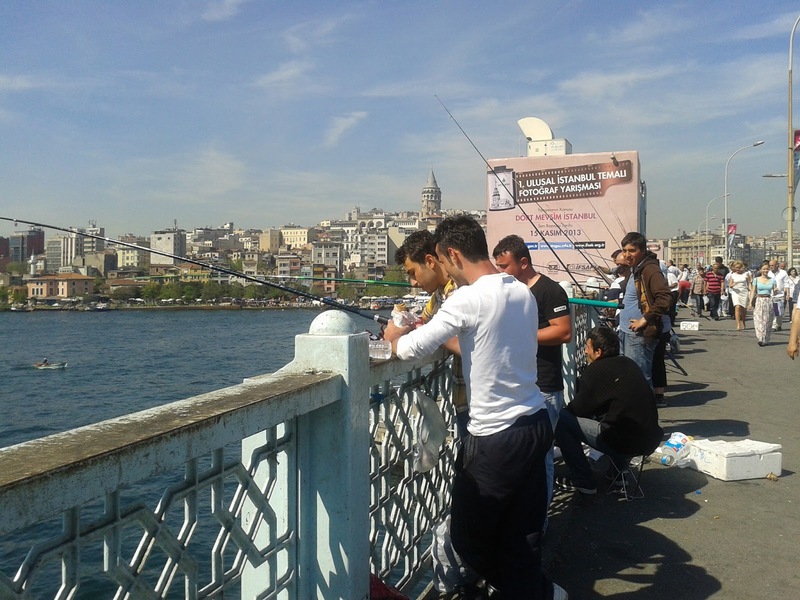 Another problem - the lines for the Galata tower are so long, we decide to try that another time. Jon and I walk while Peter limps along to the Galata bridge. 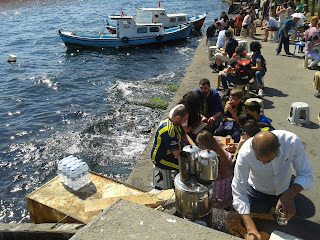 We stop at a fish market, looking out over the water and boats leaving, families out for tea and coffee in the cafes. There are lots of tourists out there, but also many Turkish families for a day out. Men fishing on the bridge are later joined by their wives, heads covered, and children. I see a little kid of about two sleeping in the shade, near his father. He is oblivious to the crowds, to the noise, completely at peace. He has no difficulty adapting to the day. Is it because he feels secure? We stroll through the Egyptian spice market. I get ripped off, buying a “sinus” tea – probably 20 grams for 20 lira, which is about €8, or $12. It is so crowded and I, like Peter am tired, so I don't bother questioning his price. Coffee and tea at the café where the Orient Express leaves from, the train featured in the Agatha Christie book and film "Murder on the Orient Express", then back across the bridge. Finally a chance to sit down, during the sufi dancing. I try and get into the mood, reading about the stages of this dance. They call this ceremony "Sema", which was partly inspired by Rumi, the most famous sufi master of all. Here in Turkey they call Rumi "Mevlevi". In the first part of this mystical journey, the dancers are dressed in black, to symbolize their original state. These clothes, our natural state, will have to be shed. Underneath the black they weare white robes. The black shows us that we have to shed/submit our natural selves to God, in order to enter into God, who is love. Before they shed their garments, though, they greet one another and their master. We need to accept - to greet and welcome ourselves, each other and our darkened state before we can shed them, receiving love. And then, now transformed by, they can again reclothe themselves in black, joining the rest of creation. Yes, I agree. Much of this sounds like the zen journey I once traveled. It sounds like our Christian journey about returning to life after being born again. This all sounds very nice, but the music lulls me into sleep. My soul is not touched by this symbol of a profound spiritual journey. For me, it is sad to be touched only slightly, in the aestheitic, cerebral part of my brain. 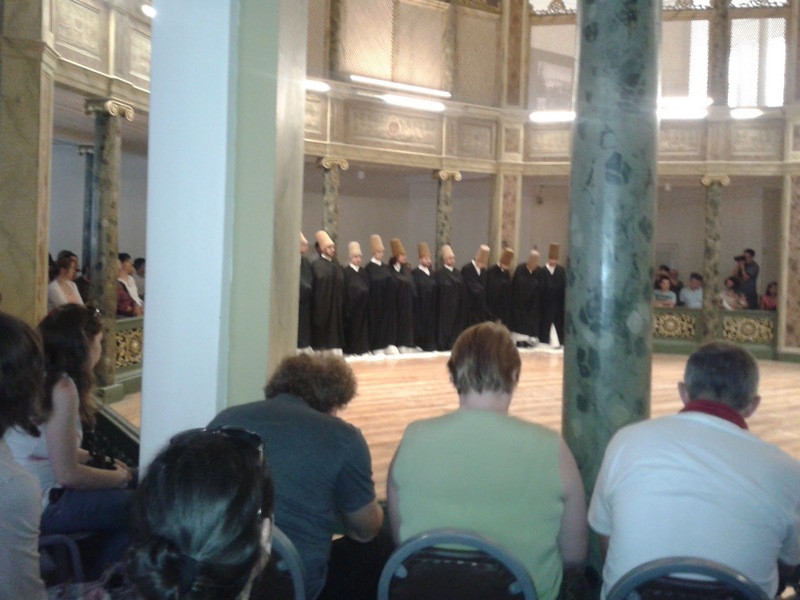 Sufi dancers begin their "journey" in black.